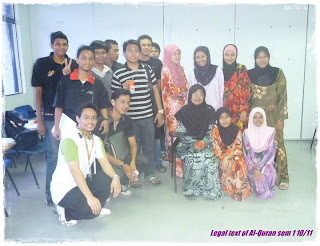 12 November 2010 - Today is the last day of semester before final exam begin. It has been 4 months of working at IIC since July 2010. The end of the semester really mix all the feeling of sadness and happiness together. A class of my students. Photo credited to my students. This week, I've been very sensitive person. I don't why but perhaps it is due to the busyness to complete their carry mark before final. In addition to that, some of my students really make me disappointed because of cheating and lying to me, and honestly I cannot judge them due to their marks and performance in class, but I need their hardworks and efforts. However, there are some students who always make me smile and do their best in study of any subjects. By the way, I still will pray for all of them to get success not only in the final exam, but for their future life, insyaAllah..
A present from my students. Jazakumullahukhairankatihra..
My hope is that to not make them remember or not forgetting me, but I do hope that they can practice what they learned along this semester, because all the knowledge that they learned are not only for their exam but will help them to be a better person, InsyaAllah.. Besides teaching, I'm learning so many things as well. Yes, I'm learning from my students. They helped me to be a good lecturer even though I'm not really good especially I'm new. This is our process of learning from mistakes and any shortcomings. The role of lecturer is not only teaching but they will learn from students as well..
End of word, I'm so grateful to teach and learn for this semester. All the best~! Be the best among the best~!